With the final of the World Cup imminent, Fikri Jermadi takes a look at a film that’s not about it at all. ‘The Other Final’ is one of the best football films I’ve ever seen. That is a claim made with the firm acknowledgement that I have not seen every football related film ever made in the history of mankind. There’s a number of very strong candidates out there, including those I’ve yet to review for this site in this fashion. Nevertheless, bear in mind that I am a very big football fan; though I support primarily Malaysia and Manchester United (my conduit into this wonderful game), I am equally intrigued by regional football in South East Asia, how the war have affected the game in war-torn zones, and Slovakian football in the mid-90s (the subject of my next football article). It is safe to say that I am very keen on the sport, and have devoured a lot of texts and material produced in relation to the game. 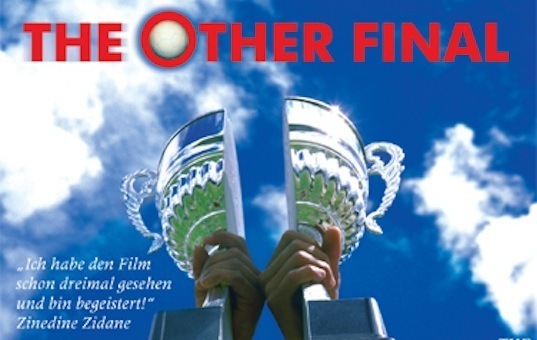 With that in mind, let me repeat the first sentence: ‘The Other Final’ is one of the best football films I’ve ever seen. They’re feeling hot, hot, hot. The concept is simple enough. 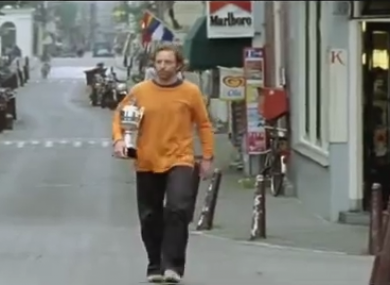 The director, Johan Kramer, was suitably down after the Netherlands failed to qualify for the 2002 World Cup. Louis Van Gaal may be critically acclaimed in this tournament for taking the Dutch as far as the semi finals in Brazil, but over a decade ago he didn’t even manage to qualify them for it. Deciding to fill his summer with something more constructive, Kramer decided to create a match between two of the lowest ranked teams at the time, Montserrat and Bhutan. Now, they are regular whipping boys of their respective regions and confederations, but that is due to a mismatch of skills and experience. Put together teams that are practically equal (however high or low that level may be), and you may have a match that is intriguing in nature, with little to separate the victors from the losers (at least in theory). He succeeded in convincing the nations’ federations into this event, and went about making a documentary that almost predictably encompasses life in both countries beyond the sport. Bhutan is a landlocked country bordered by two world superpowers, China and India. Montserrat, however, is a freer island that is nevertheless subject to volcanic activity. Tying everything together is…a ball. Now, that sounds obvious, but I mean that in a more literal sense. In almost every scene, there is a white round ball that bounces from one shot to the next, serving as a kind of link. It is a very clear and visual idea of how the world comes together for football. That in itself is not all that unique, but the method of presenting this idea is quite fresh and simple. The ball itself is white, devoid of any markings or embellishments of any kind. It suggests a return to the purer form of the sport, where all you need is just a football to kick around. Apparently, the filmmakers failed to gain any sponsorship from sportswear makers for this match, and some reviews have suggested that this is the sticking up of two fingers to capitalist driven entities. Whether it is true or not, I believe that in and of itself, the ball serves as a fine storytelling device. No frills: football at its purest. The title itself is quite intriguing as well. ‘The Other Final’ refers to the fact that the match would take place on the final of the World Cup itself. So on the same day and date Brazil would take on Germany, Bhutan and Montserrat would also take part in the same footballing activities. This is no walk in the park either. It is a proper match, with officials flown in from England to referee the proceedings. There is even a trophy, one that was very fittingly designed for the occasion. You’ll see how in the film. Now, why did I say that this was the best football film I’ve ever seen? Simply because I believe it is approached as a film. Many such projects have the more ulterior motive of promoting a certain or specific point of view, using football as the vehicle. Some may have a more exact share of the audience they intend to reach. All the same, most of these films allow for these motives to override certain filmic and storytelling considerations to the point where it becomes very good at pushing what they want to push…but they are not necessarily good films per se. ‘The Other Final’ is a very good film, with a strong narrative well developed and told in the proper way. Johan Kramer, as it turns out, is an advertising man from the Netherlands, and he appears to be a big deal as well. As such, this is a man who knows not only the considerations of such a story, but the effort required in telling that story well. For example, the film very cleverly used texts as a strong part of this effort. Most films would intrude upon the film’s diegesis of frame in a less imaginative way, with the word serving the need to identify rather than to reveal. Here, that is not quite the case, for it does both jobs with aplomb. 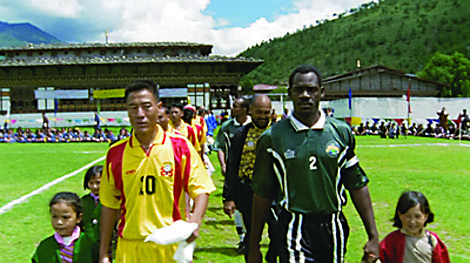 In one scene, we are introduced to Bhutan’s football federation president, as he holds the said ball and natters on about the importance of the game in the country. 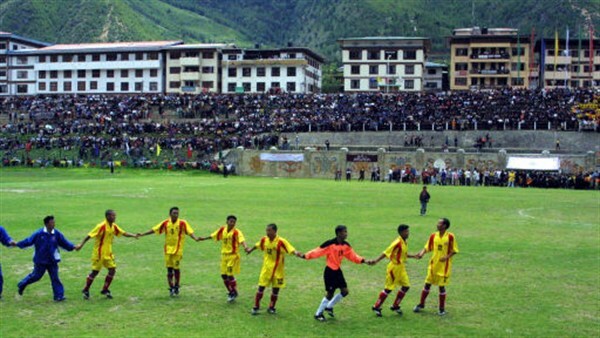 The text, however, fades from ‘President of Bhutan Football Federation’ and transitions to ‘and Prime Minister’, revealing not only the importance of the man, but the level of support this effort attained. It’s a neat technique that delights in its simplicity, and made me smile. Very effective. The Dutch couldn’t win the real thing, so here’s one they made earlier. Beyond that, the camerawork and editing are absolutely top notch. The camera work for the match would have been a lot better, truth be told, but then again, it is in keeping with the spirit of the match; many of these matches amongst the lower ranked teams and nations are never as well documented as the others. As such, it might be an intentional play on creating much of the same aesthetic for this match as well. Apart from that, though, the camera has been positioned in very attractive positions, allowing for us to really marvel in the natural environment of these very different countries. The editing…oh good lord, the editing. I’ll give you an example. Right at the very start of the film, we see the groundsman of a football pitch trying in vain to mark the penalty spot with some paint. Of course, it wasn’t the most pristine of conditions, with the pitch being flooded with water. A lingering top-down shot of the spot, and then, boom! A match cut from that to a cup of coffee, presumably in a coffee shop in Amsterdam. A match cut! In a football film! I rarely see those in ‘proper’ films, so you can imagine my delight at this. I can spend a long time going on about this documentary, but I won’t, simply because…I don’t want to spoil it. Yes, it is a match that has happened in the past, and for those who keep in touch, they may already be informed of the outcome. Nevertheless, the way the story is told is riveting in parts, and it is this process I do not wish to spoil. An attempt to reposition the match in the bigger context is also illuminating, as the title could easily refer to the main match in Japan as the ‘other’. The film offers a hint as to how this should be seen, but you can also decide for yourself. That is reflective of this entire effort: though not explicitly stated, you always feel that the film is more than just what is shown on screen. There’s meaning to be made here, but not doing so does not diminish the film in any way. There’s even a shot of Jack Warner, the disgraced football official who resigned over corruption scandals. He wasn’t as yet tainted by allegations at the time of filming, of course, but to see him struggle to even doing a series of keepy uppy while the part-time players more effortlessly did so was a wonderfully symbolic. Hell, the filmmakers even chose Moby’s ‘We Are All Made of Stars’ as the film’s main track. What’s not to like? Fikri had fun watching the World Cup this year. Hopefully you’ve enjoyed the reviews of football-related films on this blog. Next Thoughts on Films – Episode 28: The Vikings Are Here!